Two things jumped out at me when I received this press release. Firstly the name, which comes out as a mouthful – it isn’t something you could casually mention in conversation, even if you worked closely with the motherboard. The second is the amount of DRAM slots, which is ultimately what the EP2C612D24 and EP2C612D24-4L are catering for. 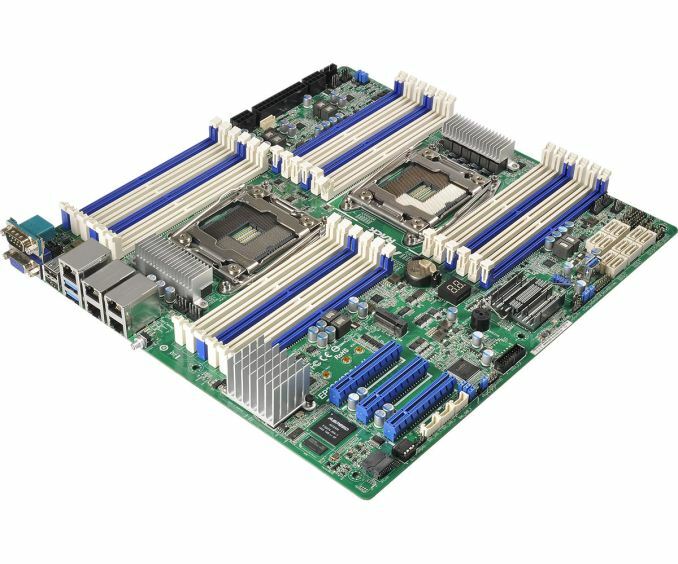 The Haswell-EP/Xeon E5 v3 DDR4 memory controllers are designed for up to three DIMMs per channel, similarly to Ivy Bridge-EP (E5 v2) and Sandy Bridge-EP (E5), although in all cases it is usually reserved for more niche systems. With 16GB UDIMMs, this allows for a maximum of 384GB, although moving up to RDIMM, LRDIMMs or 64GB NVDIMMs pushes the max to 1.5TB in a dual socket motherboard. Only those with deep pockets, big budgets or stringent requirements need apply, as the major cost here will be the DRAM. The motherboard uses a staggered processor arrangement with narrow ILM versions of the LGA2011-3 socket. Combined with the 24 DRAM slots means there is little room for anything else. 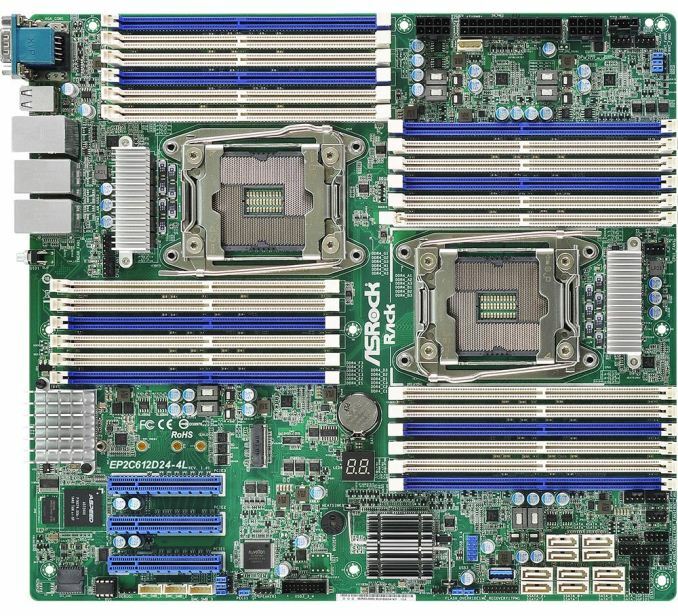 We get three PCIe 3.0 x8 slots which are open ended, allowing for x16 sized cards to come in, although one slot will be limited to reduced width cards as some of the DRAM slots would encroach a super long co-processor. The ten onboard SATA ports are supported by an M.2 PCIe 3.0 x4 slot and an onboard USB 3.0 Type-A port for in-chassis licensing dongles or Live-USB OSes. One downside to mention, according to the specifications for Haswell-EP, is that when fully populated, the memory should reduce down in speed, from 2133 to 1600 MHz. Network connectivity is provided by an Intel i350 which gives four gigabit ports on the 4L model, but only two on the regular SKU, but we also get another network port for the AST2400 which provides IPMI 2.0 network management. ASRock Rack is targeting the usual suspects when it comes to large DRAM packages – intensive compute tasks, big data analysis, Hadoop and cloud computing. But this isn't a PC. 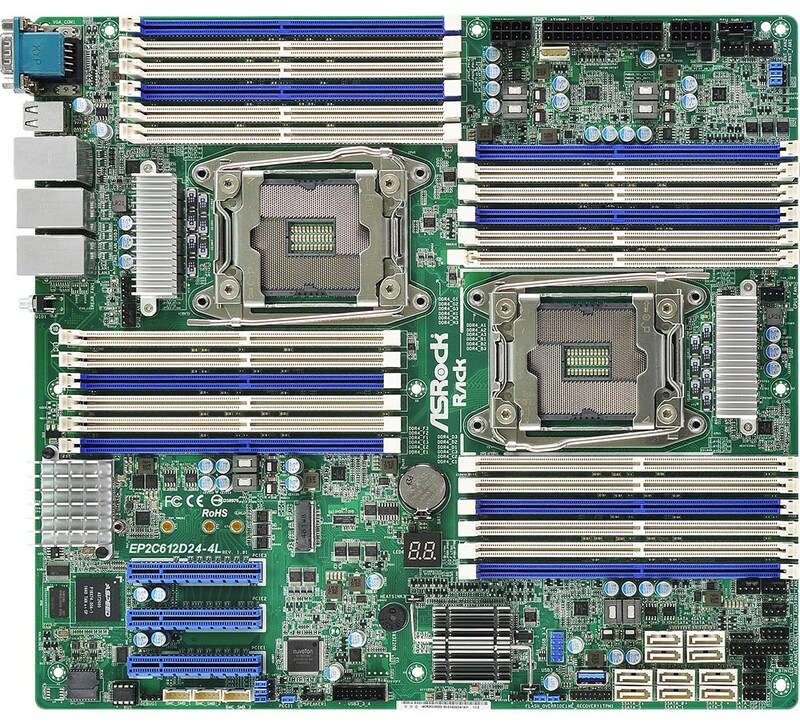 It's a server motherboard. You'd get a PC that boots in ages, makes a lot of noise, consumes an enormous amount of power, cannot use a regular gaming/professional graphics card, cannot be put in a regular case, doesn't have enough USBs, etc. And most times you'd never take advantage of the multiprocessor feature as consumer software doesn't need that. Multiprocessor is a totally different beast from multicore ;). One that doesn't do you any favors if you want to use it at home. "A personal computer is a general-purpose computer whose size, capabilities and original sale price make it useful for individuals, and is intended to be operated directly by an end-user with no intervening computer operator"
What I said very clearly is that you wouldn't build an "overpowered PC", not even a workstation, but a server. That's it. And as a server it wouldn't be that overpowered anymore. You'd have a server that you try to use as a PC, a task at which it would fail miserably. Absolutely nothing you would do on this machine will run faster than on a high end desktop using high end desktop parts. Your definition of a PC makes it quittee clear that there is no single definition for a PC. Useful to one is not useful to another. Based on that description, an individual could argue a custom built water cooled full tower gaming rig is not a PC given its price and capabilities. If I build one of these and use it as my htpc and every day computer, then it is my personal computer. My PC. And maybe my surface pro 3 isn't a PC because its a laptop or, what?